At Brighton Court, we understand that each resident is an individual with unique needs and preferences. That’s why we meet with each resident and family and conduct an assessment prior to move-in and at regular intervals after move-in. This helps us to better understand and meet each resident’s need for assistance and support. When it comes to food, Brighton Court really stands out. We prepare meals that are both nutritious and delicious. Learn more about dining at Brighton Court. 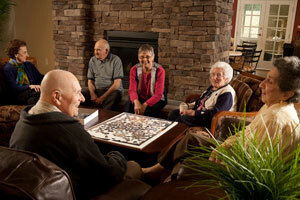 Here at Brighton Court Assisted Living Community, we believe in community and family. Learn more about our life-enhancing events and activities for our senior living residents. PEP is an individualized simple exercise program developed to enhance the independence, strength and energy of assisted living residents. The optional program supports aging by helping residents stay healthy, safe and strong according to physician recommendations and the resident’s personal goals. Results are monitored continually and the program is modified if needs change. The end of life is a period in which every individual deserves compassion, dignity and respect. Our Hospice services provide our residents with the medical care and emotional support they need to make the most of the final chapters of their lives.